Despite some truly awful weather, the first round of the Summer Hole & Hole has been completed. Well done to all of the players for managing to complete their ties in such trying conditions. Let us hope for an improvement in the weather for the second round. Our apologies for the delay but at last we have the full results and draws for the Championship and Handicap Quaich which will be held over Gullane No 1 on Monday 7th and Tuesday 8th May. We hope that some of you will come along over the two days and see what I am sure will be some great golf. Finally, congratulations to those who had two’s on Monday: Christian Blake (9th); Audrey Dunnett (9th); Samantha Frost (9th); Gill Morrison (13th); Carole Ross (13th); Hazel Saunders (16th); Lorna Thomson (16th); Dee Williams (9th); Dawn Young (9th). It was reported last night that publication of the Spring Meeting results had been delayed because of software problems relating to CSS calculations. This arose because we are required to calculate separately the CSS for Gullane members and non-Gullane members, but the handicapping software cannot provide this functionality for Counties and Associations because we are not responsible for any members’ handicaps. The CSSs have therefore been calculated manually, and came out as 78 (3 higher than SSS) for Gullane members and 77 (2 higher than SSS) for non-Gullane members. In this circumstance, CONGU requires a single CSS to be calculated, and this came out as 77. Because of the confusion, there is a risk that the results may have been communicated to Home clubs twice, and we suggest that you check your handicap record to make sure this has not happened. If it has, you will need to ask your Home Club to correct this. Many apologies for these complications. Congratulations again to those with winning scores. We are still awaiting final confirmation of player availability before publishing the draw for the Championship and the Handicap Quaich, and these will follow shortly along with the list of twos and the full results. Best gross scores: Lindsey Garden (81); Pam Hall and Dawn Young (82); Alyssa Balding and Lesley Johnston (83). Despite the windy conditions there were an amazing 9 “twos”. Full details to follow. The Cuthbertson Cup was played on Sunday 22nd April 2018 at Baberton in cold and blustery conditions. Fortunately the heavy showers came at lunchtime when they (and the team officials and parents) were all inside enjoying their soup and sandwiches and after play was complete. Our team of Lucy Hall, Grace Crawford, Annie Wilson and Annabel Hosie gathered at the practise putting green before heading down to the tee. In the Morning games the Fife team of Hannah Braidwood, Eilidh Henderson, Charlene Wilson and Porscha Wilson beat Stirling and Clackmannan 4-0. 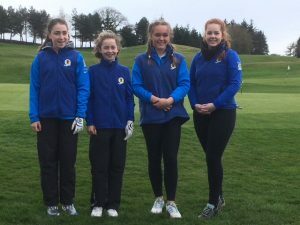 The Midlothian team of Carys Irvine, Lucy Morrison, Lauren Reid and Mollaidh Nicholson drew with East Lothian 2-2. In the opening game Annabel lost to Carys, Grace beat Lucy Morrison, newcomers to the team, Annie beat Mollaidh and Lucy narrowly lost to Lauren at the 18th. Following a countback East Lothian lost out and Midlothian went through to play Fife for the trophy while Stirling and Clackmanan played East Lothian in the Foursomes. The very strong Fife team beat Midlothian 4-0 while East Lothian were the winners in the Foursomes with 2 good wins. Our first golfing event of the year was held in the sleet at Liberton Golf Club yesterday 2nd April 2018. 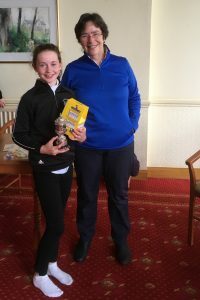 In a new venture this was our first joint Junior event with Midlothian. Both Counties presented their own players with their County prizes but it makes for a bigger and hopefully more better event for the girls. Unfortunately the weather was not kind to them and the decision was taken to cut the competition to 9 holes. 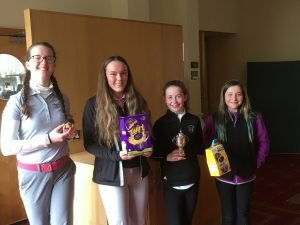 There were 5 East Lothian girls in the draw of 14 entries although there was one call off on the morning due to a persistent. Pictured below are the four girls who battled round in the sleet and cold and Grace Crawford with the Scratch Trophy. Hopefully the Easter eggs helped make up for the weather. Well done girls in taking part. We look forward to welcoming Midlothian girls to future events in East Lothian when we will try for better weather. The Cuthbertson Cup will be held at Baberton Golf Club on Sunday 22nd April 2018. This year’s team is a mixture of familiar and new faces. For those not familiar with the format, this is an all day event with Stirling & Clack v Fife and ELLCGA v Midlothian playing singles match play in the morning. The morning winners play each other in the afternoon again in the singles format and the morning losers play each other in a foursomes format. The matches are off scratch. We wish the team good luck.